Over and under, round and round. Don’t let the lines touch. 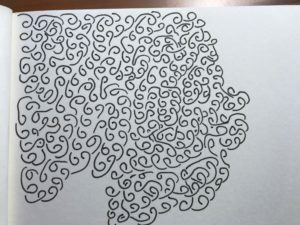 I used to doodle little spirals on the sides of my notes in school. Once I even filled an entire page with the little loops and twists that weren’t allowed to touch. It became a challenge to create a design with as many loops and twists as I could. It’s no wonder that I was fascinated with the artwork of M. Escher and Celtic knots. Escher’s tessellated images shifting from one image into another or the misdirection of his three-dimensional images were wonderful to stare at. Celtic knots in their own way wove endless paths. When I started quilting thirty some years ago, I loved the appearance of a well-done attic window quilt and did several for my children, with fish or dinosaurs behind the “windows”. 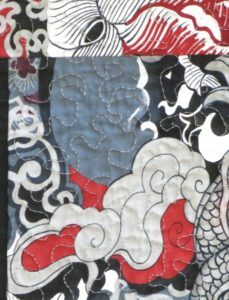 When I learned how to machine quilt with my mom’s Singer Featherweight, I naturally shifted to stipple quilting, or “doodling” as I call it. Adding the quilted design over a quilted top became another passion for me. Then, two years ago, I joined with Julia Deal of SEW Artistic to start creating and testing patterns. We each wrote patterns and tested each other’s. 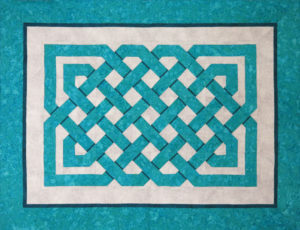 That’s when I got the idea to try a Celtic knot quilt. I wanted to emulate the three-dimensional appearance of the drawings I so admired, and searched for a way to add the shadows and depth to create that richness. The only Celtic knots I’d found created the over-under effect using appliqué, binding tape, or using multiple colors for the weaves. Paper-piecing provided the complexity and the simplicity that I was looking for. I have been able to show more depth with the introduction of shadow fabrics. MAM-130 Celtic Weave Quilt pattern is the first of my paper-pieced Celtic weave quilts. You can check out the quilt pattern here. There are more Celtic blocks in the works that will be interchangeable with the ones in my Celtic Weave. I’ve also been experimenting with creating a more realistic three-dimensional appearance. Like the Celtic knots, my passion for Celtic knots is endless. You can see our full selection of MAM patterns here.